Contributed by Madeline D’Aquila, BS, Clinical Research Associate II & Annie Racine, PhD, MPA, both of the Institute for Aging Research, Harvard Medical School, Boston, MA. Although successful programs to prevent delirium have been developed and implemented, advances in new prevention or treatment approaches have been stymied by a poor understanding of delirium pathophysiology. Neuroimaging technology provides a window into the most implicated organ in delirium yet one of the least understood: the brain. When a patient becomes delirious, what has gone awry in their brain? Are brain abnormalities causally related to delirium, and if so, how? The answers to these decades-long unanswered questions have the potential to revolutionize delirium prevention, diagnosis, and treatment. Image from an MRI scan. One of first review articles of delirium and neuroimaging published in The Journals of Gerontology in 2006 reviewed the current state of knowledge and highlighted the great promise of neuroimaging in delirium research. As predicted, significant progress has been made since then to explain delirium’s functional and structural pathophysiology using novel neuroimaging techniques. 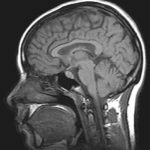 Structural neuroimaging provides images of the brain’s anatomical structure and is commonly performed in research studies using magnetic resonance imaging (MRI) but also computed tomography (CT). Functional neuroimaging, on the other hand, provides dynamic images of the brain that are taken over a period of time as a patient is at rest or completes a task. Some functional brain imaging techniques that have been used to study delirium include functional MRI (fMRI), positron emission tomography (PET), and electroencephalography (EEG). Since delirium following surgical procedures (known as postoperative delirium or POD) is common in older adult patients, many researchers have compared brain differences or changes in patients who developed POD to those who did not develop POD. A variety of imaging techniques have been used to study delirium, but structural MRI has been the favored modality to study gray and white matter abnormalities. The collection of studies to date does not support a clear association between POD and neurodegenerative changes (e.g. brain volumes), but a more consistent pattern has emerged between POD and neurovascular changes. For instance, Maekawa et al and Otomo et al have shown preoperative cortical brain infarcts to be associated with greater incidence of POD. Examples of these types of neurovascular changes can be seen in Figure 2. It is possible that brain tissue lesions (e.g., infarcts and white matter hyperintensities) make the brain more vulnerable to hemodynamic and functional changes, leading to delirium, but further research is needed. Although Cavallari et al and Shioiri et al have shown that gray matter neurodegenerative changes have been decidedly mixed, somewhat more consistent findings have been observed in terms of white matter connections in the brain. Papers published in Brain and Neurology reported intriguing associations between POD and both cross-sectional and longitudinal changes in white matter microstructure (measured by diffusion tensor MRI) in a relatively large imaging cohort of more than 100 patients imaged prior to and one year after surgery. One theory connecting these findings is that both white matter vascular and microstructural abnormalities may affect the connectivity between brain areas involved in cognitive-behavioral functions, and damage to structures of relevant brain networks may increase vulnerability, thereby enhancing the risk of developing POD. Similarly, a recent article in the Journal of the American Geriatrics Society put forth the theory that delirium results from a breakdown of brain function in individuals with impairments in brain connectivity and brain plasticity exposed to a stressor. However, rather than studying structural dysconnectivity, they proposed to test their theory using functional measures of brain connectivity and plasticity (Transcranial Magnetic Stimulation in combination with Electroencephalography), providing one of many examples in which functional and structural neuroimaging techniques provide complementary approaches to studying some of the most vexing neurological questions. Indeed, functional neuroimaging has provided important insights into the neuropathophysiology of delirium. According to a review published in 2017, hemodynamic impairments (such as reduced perfusion, cerebral blood flow, and oxygenation) have been consistently associated with delirium. Since proper brain function is intrinsically linked to adequate glucose and oxygen supply, one etiologic theory postulates that disparities in energy supply or energy demand may lead to delirium and brain dysfunction. PET has only recently been applied to the study of delirium but represents an important advance in the field. In a pilot study published in Neurobiology of Aging in January of this year, POD was not associated with brain amyloidosis (quantified by 18F-Flutemetamol-PET), suggesting that delirium may be amyloid-independent. A recent study published in the Journal of Cerebral Blood Flow and Metabolism of 6 patients scanned using 2-18F-fluoro-2-deoxyglucose (FDG)-PET both during and after an active delirium episode found widespread cortical hypometabolism during delirium. Interpretations should be made with caution given the small sample sizes of these two PET studies, but they nevertheless demonstrate the potential for the application of PET in studying delirium. Future prospective studies involving substantially larger sample sizes, matched control groups (with and without dementia and/or mild cognitive impairment), longitudinal imaging before and after delirium, in vivo imaging combined with in vitro and post-mortem imaging, and standardized cognitive testing and daily delirium screenings have the potential to clarify some of the ambiguity in delirium neuroimaging research thus far. If researchers are interested in imaging brains of actively delirious individuals, it is important to consider ways to maximize feasibility of imaging these individuals due to the nature of delirium, including short scanning times and resting state scans (instead of task-based scans). The field would further benefit from additional PET studies of Alzheimer’s and more general pathological markers (e.g. amyloid, tau, inflammation, glucose metabolism) in order to enhance our molecular understanding of delirium. An important next step will be to translate group-level neuroimaging findings to individual patients. However, delirium is a multifaceted disorder and multiple pathways likely converge to cause delirium; therefore, it is possible that heterogeneity in research findings will persist even with these scientific advances. Despite heterogeneity in study design and findings, the growth of neuroimaging research in delirium has undoubtedly improved our understanding of delirium and has pointed the way towards important research directions. Advances in and greater accessibility to neuroimaging technology make it likely that neuroimaging will continue to be an important methodology for studying delirium pathophysiology and will eventually contribute to delirium prevention, diagnosis, and treatment. Posted in Delirium Research, NIDUS Blog and tagged Delirious Brain, Delirium, Neuroimaging, Study.